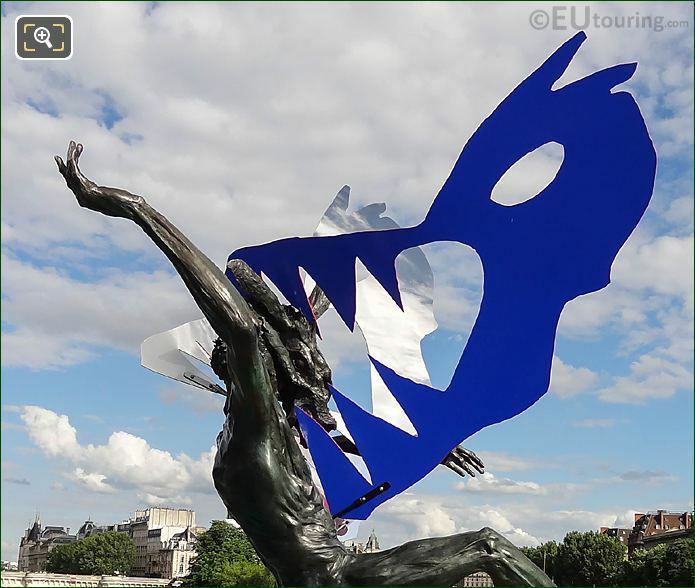 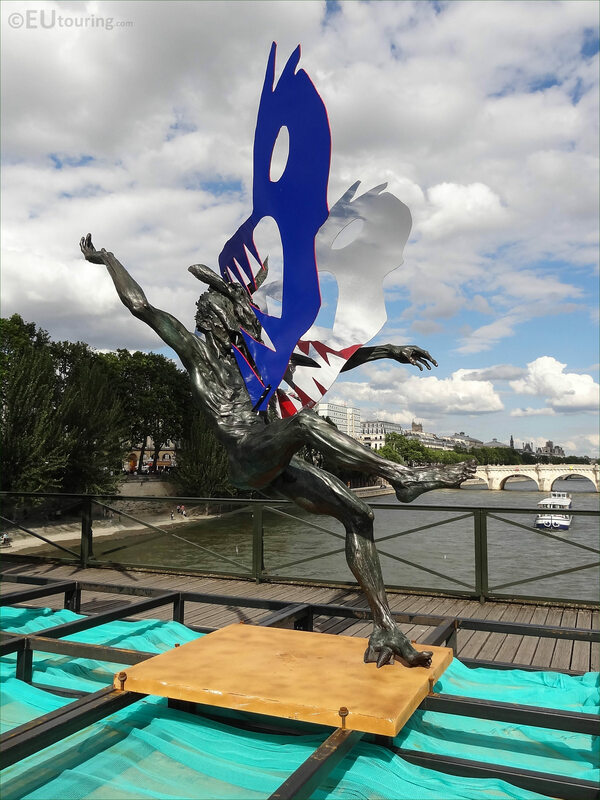 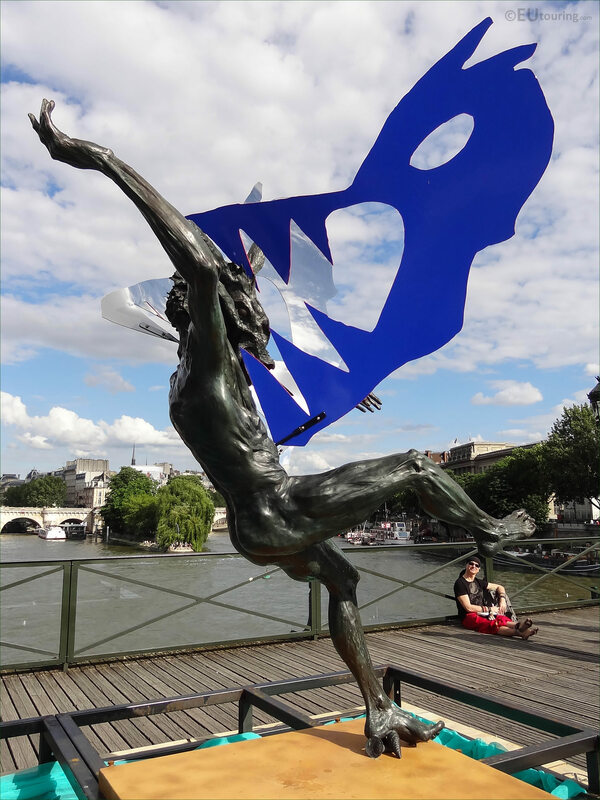 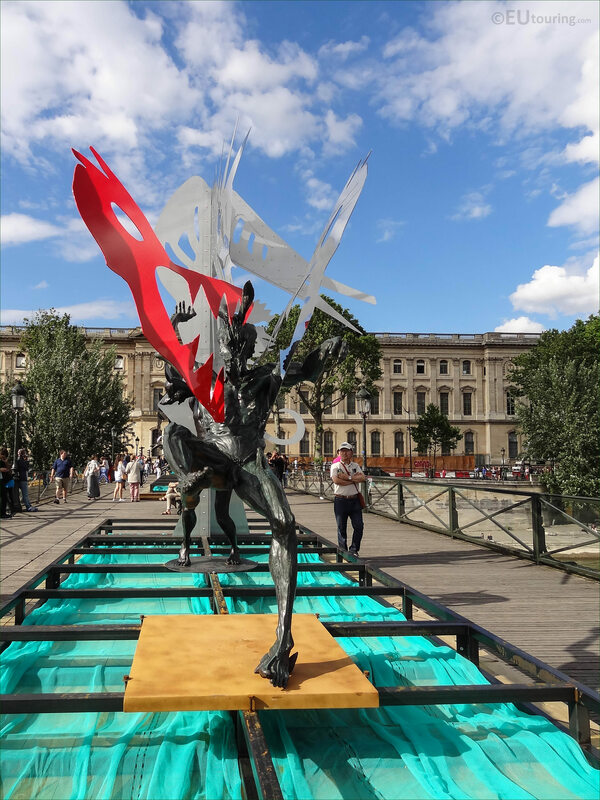 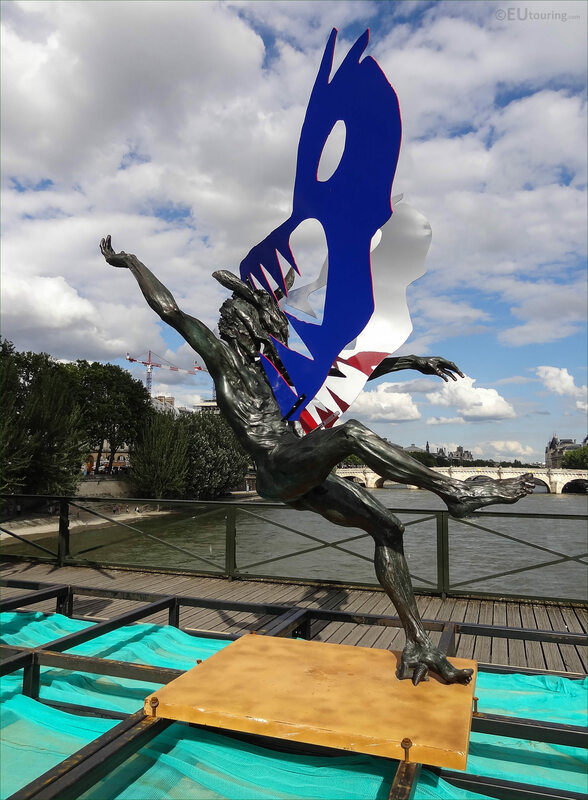 We were again at the Pont des Arts in Paris, when we took these high definition photos showing a sculpture called Dans la Gueule du Loup, which was sculpted by Daniel Hourde. 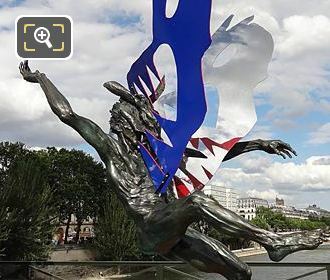 This first HD photo shows a statue and sculpture called Dans la Gueule du Loup, which in English translates as In the Mouth of the Wolf, and as you can see there is a mythical being and the skull of what is meant to be a wolf. The Pont des Arts used to be known as the Bridge of Love, with people coming from all over the world to attach a padlock to the railings, but unfortunately this got dangerous due to their weight, and therefore the City of Paris decided to remove these and replace the railings with plexiglass panels, as you can see here. 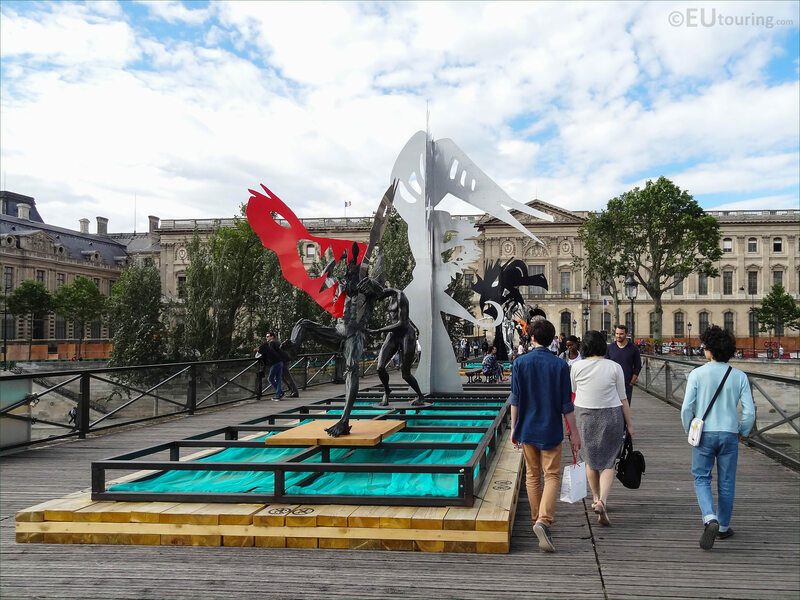 But before lovelocks became popular, the Pont des Arts used to sometimes have temporary art exhibitions on the bridge, and the idea was to bring this tradition back to the historical footbridge over the River Seine, which goes between the Musee du Louvre and the Institut de France. 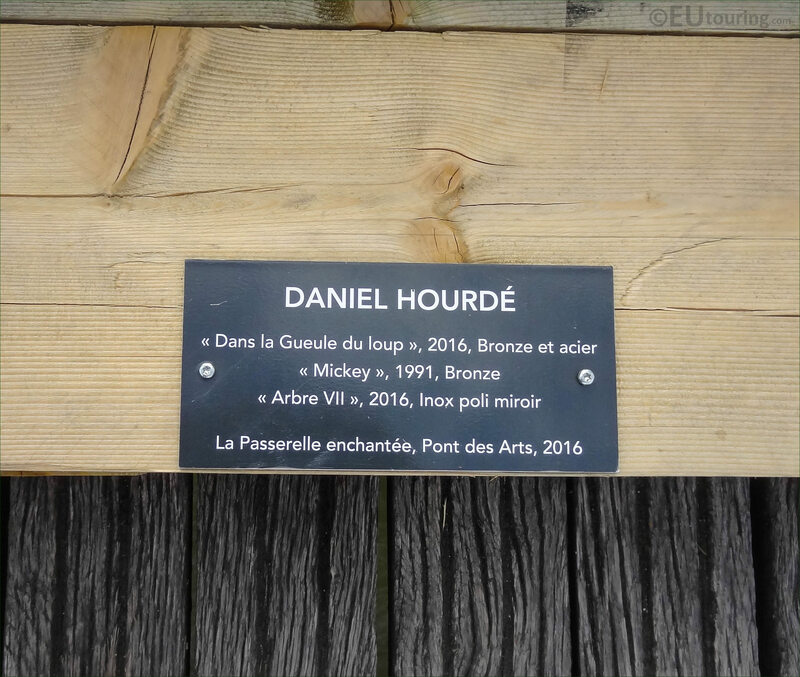 So a contemporary French artist called Daniel Hourde was the person chosen for a temporary exhibition of his art, and running alongside a solo exhibition at the Galeries Agnes Monplaisir, he named the installation La Passerelle Enchantee, which translates in English to The Enchanted Footbridge. 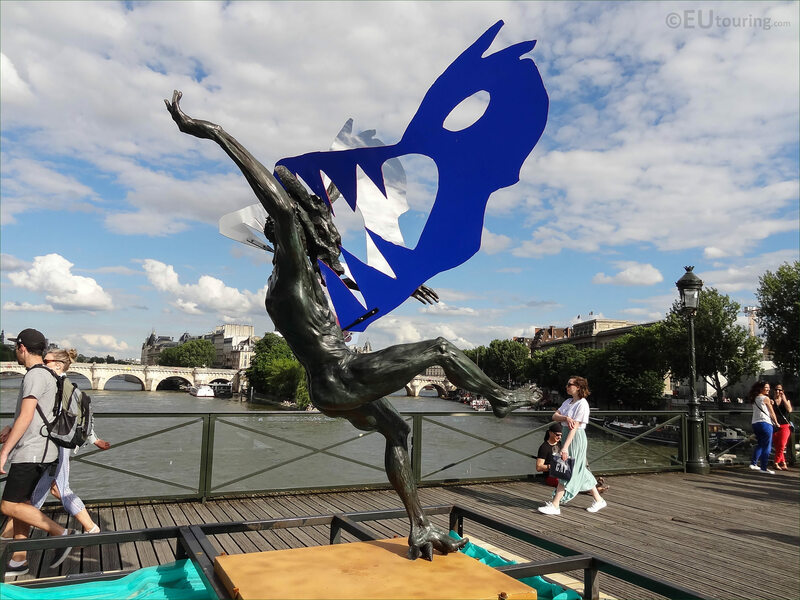 Yet here you can see the figure of a man, yet with a creatures face in a mythical style, which was sculpted in bronze, and looking like he is falling back, the blue animal face was made of steel and is depicted as though it is a wolf attacking and has the head in the grips of its teeth, hence the name Dans la Gueule du Loup. 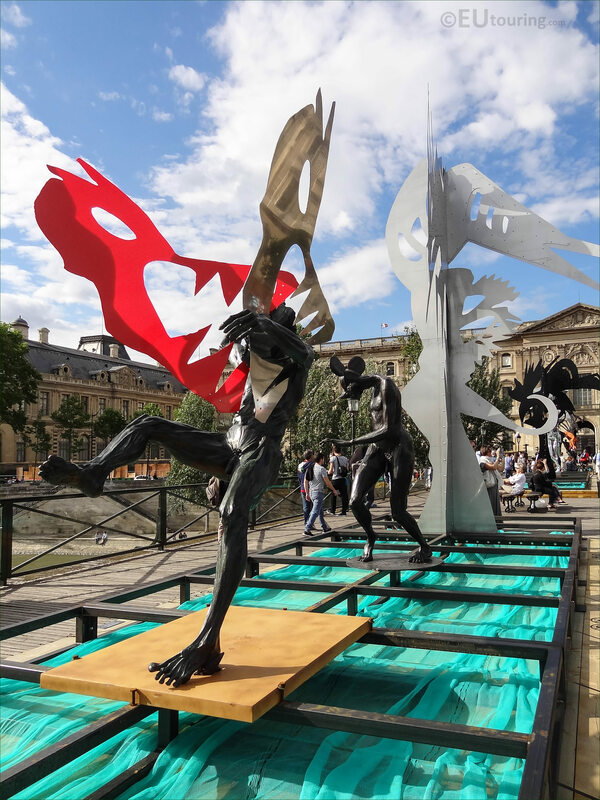 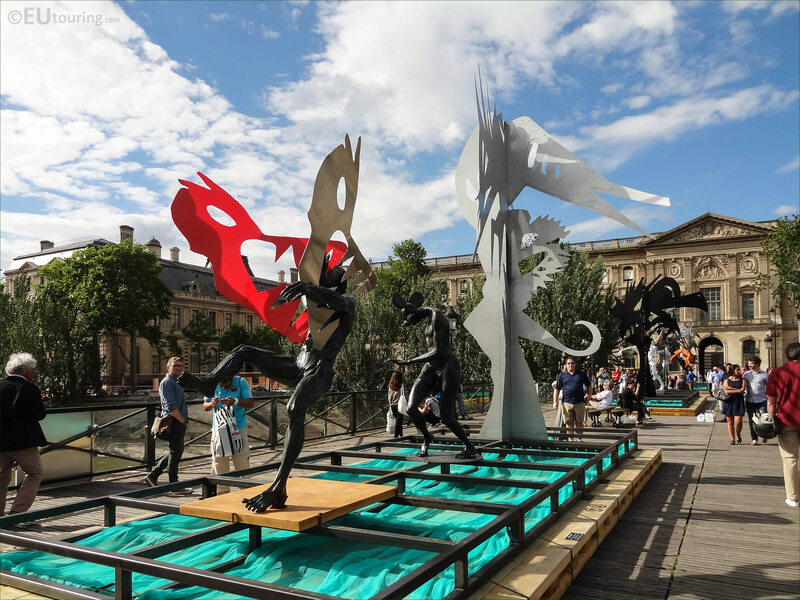 But here you can see several of the different statues and sculptures by Daniel Hourde that have been placed onto temporary platforms on the Pont des Arts, with many people being involved including Simon Drotter for the installation, Jean-Marc Weill for the engineering, and Woytek Mazurek for the technical design. 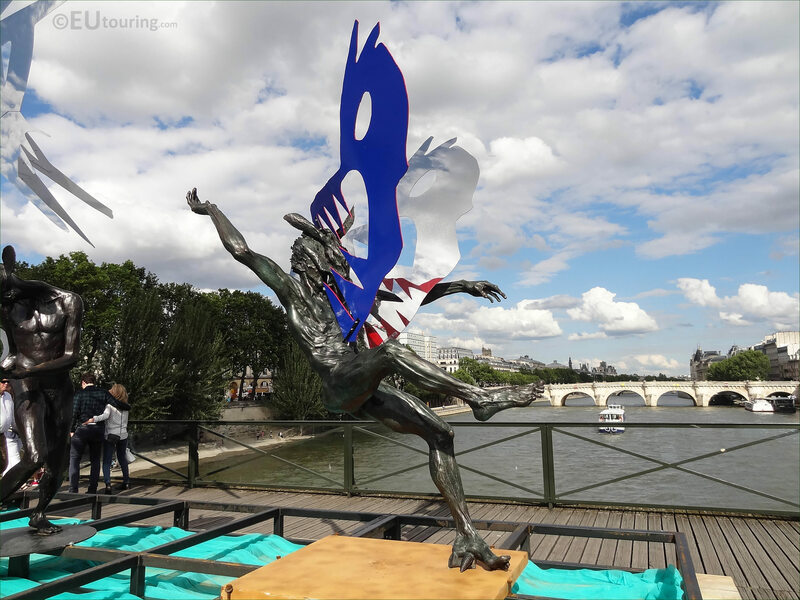 Now this particular contemporary art statue and sculpture called In the Mouth of the Wolf was only actually produced by Daniel Hourde at the start of 2016, and the idea he had was to utilise metals to provide a sort of transition between how the Pont des was with the padlocks and what it is like now, with a lighter feel that could still bring to light the magic of the bridge. 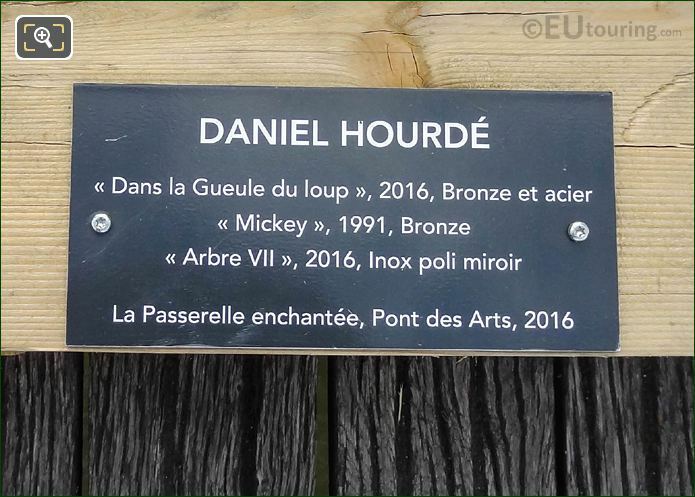 Therefore, the way that Daniel Hourde has sculpted the steel pieces reinforces the name of the temporary installation of The Enchanted Footbridge, as some of the surfaces are shiny and reflect the scenes around, such as the clouds, as you can see here. 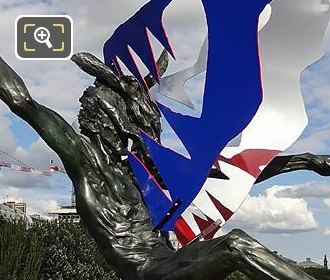 Although instead of blue showing on one side of the wolf face, looking from a completely different angle you can see the colour red, which really makes this statue and sculpture even more dramatic, especially with the title of In the Mouth of the Wolf. 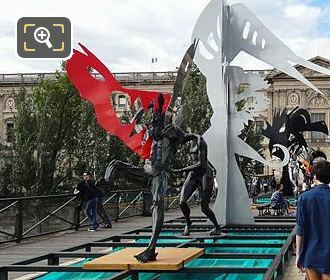 However, this close up photo shows the tourist information plaque listing three different sculptures and statues including Dans la Gueule du Loup by Daniel Hourde, which were positioned on this one temporary platform put in place on the Pont des Arts for La Passerelle Enchantee contemporary art exhibition in Paris.